The Family Eating Disorders Manual is obviously intended to be read by family members of an individual with an eating disorder. However it also contains a wealth of concise, helpful information for the new or experienced professional. I wish this book had been available 15 years ago, or any time between now and then, as I would have recommended it to every one of my patients’ families. Before I had even finished reading it, I had already recommended it to a colleague who asked me how to help her sister, whose daughter is in treatment. The credentials of the many authors are impeccable. Even before the publication of this manual, their combined contributions to the eating disorders field have impacted much of our current knowledge and practice. 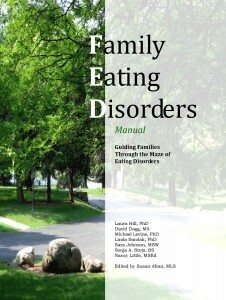 Unlike other books written by multiple authors, The Family Eating Disorders Manual is cohesive and structured. Although each chapter lists its individual authors, the topics flow and the format is standardized, unlike many compilations that are simply a hodge-podge of chapters each written by someone else. The overarching theme of the book is that family members did not cause their loved one’s eating disorder, but if they are willing to choose the path of education and compassion, they can support and enhance their loved one’s recovery. The preface states that the book is based on the Center for Balanced Living’s family education program, developed in 2006 and then refined based on input from participants and data analysis. Five of the first six chapters are set up as the response to questions we have all been asked innumerable times, such as “What’s happening to my loved one?” and “What can I do?”. The answers start out broad (“The neurobiology of decision-making and eating disorders”) and hone in on practical tools and suggested responses. The latter chapters and appendices cover behavior change theory as it applies to eating disorders, nutrition basics, caring for the caregiver, and an explanation of the treatment team approach and typical levels of care. Each chapter ends with “Questions for Reflection,” providing space for the reader to write his or her own answers and notes and enhancing the collaborative tone of the book. Naturally, I took special interest in Chapter 8: Food as Medicine, ably written by Dietitian Sonja Stotz. I was initially skeptical, wondering if I would have to rip out this chapter before giving anyone the book, as I have been burned by family-oriented folks who discount dietitians. So please appreciate the significance of my conclusion: I wouldn’t change a thing. Sonja articulately conveys the role of each member of the refeeding triumvirate – dietitian, family member, patient – while emphasizing the absolute necessity of both communication and structure. I especially appreciated her description of the many factors the dietitian takes into account when developing the recovery meal plan, something that might give those do-it-yourselfers pause. My favorite part of the chapter was everything – the way it encompasses so many positive messages while emphasizing appropriate boundaries. In other words, everything I like about the manual as a whole. The Family Eating Disorders Manual fills a gaping void in the eating disorders field, and is not just for individual family members. It could be used as a leader’s guide in multi-family support groups, and a quick refresher for a professional who needs to catch up on the latest in the field. Offering a combination of education as well as strategy, the latest in research plus the voice of experience, empowerment along with respect, this book will be recommended daily by eating disorder professionals who will be thrilled that they didn’t have to write it themselves. Weaving a rich tapestry of multicultural myths, ancient legends, and simple folk-tales, Anita Johnston inspires women to free themselves from disordered eating by discovering the metaphors that are hidden in their own life stories.